Candied citron was one of the ingredients for holiday fruit cakes. The citron, although looks similar to a lemon, is not used for juice, but for it's very thick pith, which is candied. Initially, watermelon rind was used as a local substitute for the imported citrus citron. Take the rind of a large watermelon not too ripe, cut it into small pieces, take two pound of loaf sugar, one pint of water, put it all into a kettle, let it boil gently for four hours, then put it into pots for use. Maryland cookbook author Elizabeth Ellicott Lea put the hard, rather bland fruit through numerous boilings to transform it into a candied citron sweetmeat in 1846. 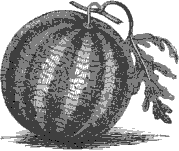 The American edition (Boston, 1798) of Richard Briggs' The New Art of Cookery contained a candied citron melon. Pare the melon and cut it in slices half an inch thick, without the seeds; let it lay in salt and water for an hour, then wash the salt off, and boil it in strong ginger tea; make a thin syrup and boil it again, then make a syrup of a pound of loaf-sugar to a pound of citron, and boil it in this till it is clear; season it with mace and lemon peel. The mock citron actually filled many more than three jars (I plan to try Lea's watermelon rind next). But the slices do shrink down, like pumpkins, so figure size you want accordingly, Lea stated a half inch thick. I think you have swapped the last 2 digits of the edition of the Amelia Simmons cookbook; try checking the 1798 edition for the recipe.